The trademark Feralun was registered by the American Abrasive Metals Corporation, 460 Coit St., Irvington, New Jersey, 07111, in 1975. The product consisted of CAST METAL HAVING A SURFACE COATED BY GRANULAR MINERAL ELEMENTS, AND USED AS SURFACES FOR PUMPS, PIPES, LINING PLATES, GRATES FOR COAL-CHUTING JIGS, STAIR TREADS, TREAD SURFACES, AND SURFACES WHICH ARE HIGHLY RESISTANT TO ANY ABRADING ACTION AND WHICH HAVE ANTI-SLIPPING PROPERTIES. The 1975 filing for trademark registration cited "FIRST USE IN COMMERCE: 19110424." In 1911 American Machinist, 26 Jan. 1911, reported, "The American Abrasive Metals Company, New York, has been organized to manufacture and deal In hardware machinery, mill supplies, etc. Capital. $100,000. Incorporators, W. H. Sayre. W. M. Beard, Glen Ridge, N. J.: A. D. Morris, New York." The American Abrasive Metals Co. maintained offices in New York City at 50 Church St. from 1911 to 1941. In 1942 they moved their operations to Coit St., Irvington, New Jersey. Founder and original president of the company was William Heysham Sayre (1865-1921). William H. Sayre received the following obituary in the Transactions of the American Society of Mechanical Engineers, Vol. 43, 1921, "William H. Sayre, president of the American Abrasive Metals Co., died suddenly at his home in Glen Ridge, N. J., on January 6, 1921, from a severe heart attack. Mr. Sayre was born at Mauch Chunk, Pa., in September 1865. He was graduated from Lehigh University as a mechanical engineer in 1886. Beginning his practical experience in railroad building in the Northwest, in which he became associated with John B. McDonald, Mr. Sayre later became well known as president of the International Contracting Co., executing many important dredging contracts in New York and other harbors and being called upon to act as a consulting engineer on the Cape Cod Canal. He was among the first to apply electric welding commercially, organizing the Federal and the Anthracite Electric Welding Companies. In the safety engineering field he was known for his development of the American Abrasive Metals Co., of which he was president until the time of his death. Mr. Sayre was a member of the American Society of Safety Engineers and was instrumental in its successful reorganization. He became a member of The American Society Of Mechanical Engineers in 1911 and served on its Boiler Code Committee, in which he was especially interested." Safety; Bulletin of the American Museum of Safety, Jan. 1915, describes an exhibit of Feralun, "slip-proof treads for stairs, sidewalks, boiler and engine room floors, steps and running boards around moving machinery, etc." This is available on google books. Safety Engineering, July, 1917, featured an article on the Feralun Safety coal chute covers. This advertisement for American Abrasive Metals appeared in The Journal of the American Institute of Architects, Oct. 1917. This advertisement for American Abrasive Metals appeared in the "Industrial Section" of the Structural Service Book published by the American Institute of Architects, 1917. This advertisement for American Abrasive Metals appeared in The American School Board Journal, vol. LXIII, no. 5, Nov. 1921. This advertisement from 1922 introduced Bronzalun to the American Abrasive Metals product line. In 1922 The Modern City, Oct. 1922, pg. 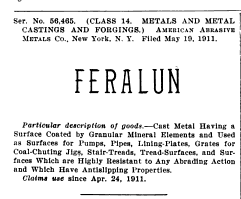 16, published by the League of American Municipalities, announced, "THE AMERICAN ABRASIVE METALS COMPANY of 50 Church Street, New York City, the manufacturers of Feralun, Alumalun, Vulcalun and Bronzalun anti slip treads announce their appointment by the Carborundum Company of Niagara Falls to act as U. S. sales representatives through whom will be marketed the Carborundum Anti-Slip Tile. This adds an important product to the line of anti-slip walkway surfaces marketed by the American Abrasive Metals Company and greatly increases the scope in which anti-slip protection can be employed advantageously." The American Abrasive Metals Co. entry in Sweet�s Architectural Catalogue, 1917, reads, American Abrasive Metals Co., Hudson Terminal Building, 50 Church Street, New York, N. Y. Manufacturers of Feralun Anti-Slip Tread Surface. Sweets 1917 includes the Feralun trademark with "Underwriters' Laboratories, Inc. Inspected." The American Abrasive Metals entry in Sweet�s Architectural Catalogues, 1933, reads, "American Abrasive Metals Co. / 50 Church Street, New York, N. Y. FerAlun, BronZalun, AlumAlun, and NicAlun Anti-Slip Walkways / General Description / Composition � Feralun Treads are made of a special iron in which is incorporated, at the time of casting, the hardest known electric furnace abrasive product. This abrasive grain is concentrated in and completely covers the wearing surface, assuring not only long wear and greatest non-slip qualities." This illustration of Feralun is included in the article. 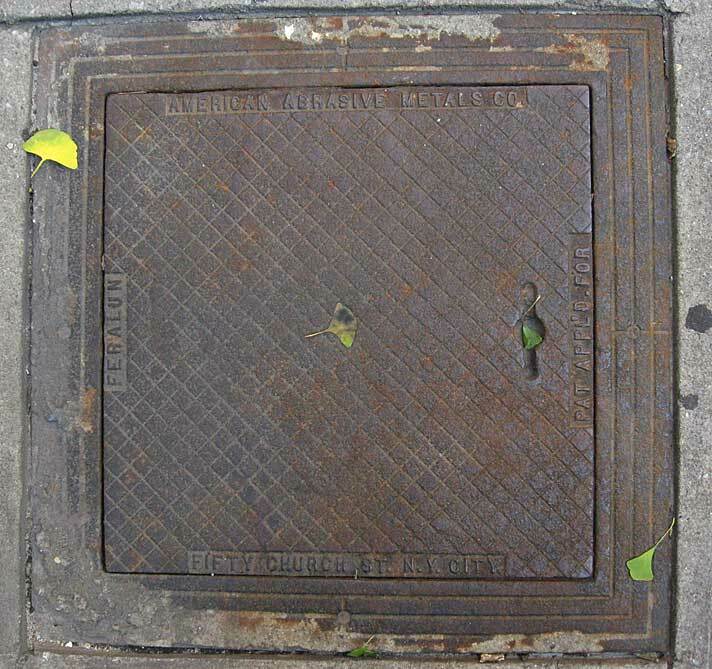 The sidewalks of New York are replete with Feralun / American Abrasive Metals lids and covers. Always square and seemingly of uniform size, many carry a patent date, Oct 30, 1920. As far as I can determine this date does not match any patents issued to William Sayre or to American Abrasive Metals Co. The U. S. Patent Office site, http://patft.uspto.gov, indicates that no patents were issued on this date. Google Patents has Patent 1,403,005 issued 10 Jan. 1922 which consists of a method of casting iron with wear-resistant material, but again there is nothing with the date 30 Oct. 1920. The "Feralun" statement on these lids often reads, "Reg. US. Pat. Off. / A. A. M. Co. N. Y." (click for image). At other times it reads, "Und. Lab. Insr. / A. A. M. Co. N. Y." (click for image). This designation indicates the product was tested and insured by Underwriters Laboratories Inc.